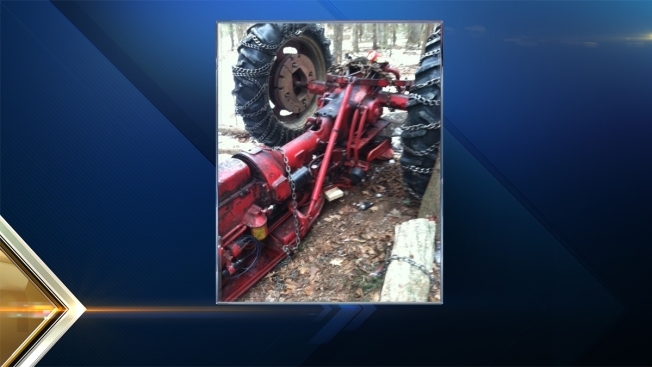 A Maine man was pinned beneath his tractor for hours after it flipped over while he was hauling trees over the weekend. Maine State Police said Kenneth Bragdon, 42, of Greene, was hauling trees on his property on Buzzell Lane when a tree he was dragging became snagged on another and caused teh 1953 Farmall tractor to overturn. Buzzell was trapped under the tractor for more than two hours in 15 degree temperatures until he was finally able to contact a family member by cell phone. The Green Fire Department responded to the scene, freed Bragdon, and transported him to an awaiting Lifeflight medical helicopter. He suffered internal injuries and is being treated at Central Maine Medical Center. State police said the chain being used to haul the logs was attached too high to the rear of the tractor, which caused it to flip end over end.